Christmas seems to be one of those times when just about every producer comes up with special editions. Often this seems to be a quick repackage with holly on the packaging and sleigh bells playing in the background, but sometimes you get something genuinely different. This week’s coffee is Taylors Christmas Blend – described as “complementing the festive period perfectly”, have they produced a truly Christmassy coffee, or is it just After Dark with a fancy label? The grounds have a dark, rich aroma with a background of woody spices, a hint of tobacco and just the barest whiff of chocolate. Brewed, you lose some of the spice and it develops a slight wood smoke character and even a touch of honey. On tasting, it’s a little tame – the flavour of coffee is there but it’s understated, surprisingly so given the richness of the aroma. 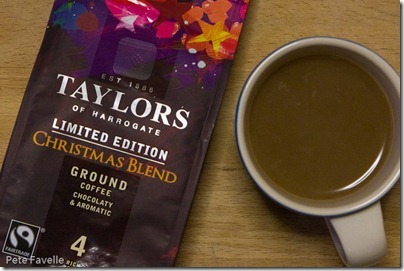 The finish is quite astringent, which would probably work nicely with food (and to be fair, Taylors do talk about this coffee being “bold enough to match with Christmas foods”) but makes for a less satisfying stand-alone coffee. Overall, a coffee that smells better than it tastes – the aroma really does bring a Christmas character (especially the grounds) but once it’s in the mug it’s just a nice cup of coffee. It’s on the mild side for a strength 4 coffee, but it’s still undeniably a nice mug and earns 3 stars.